Singer/songwriter SONiA has performed in seven countries and has seven award-winning albums to her credit. With captivating love songs, SONiA confronts the hypocrisies and biases of our culture with a positive message of openness and optimism. In 1988 SONiA, along with her sister, Cindy Frank, formed the band DISAPPEAR FEAR. After four albums together, including the GLAAD Award for Album of the Year, Cindy left to become a full time mother. SONiA, now solo, continued her career with two award-winning albums. SONiA has performed with Sarah McLaughlin, Jewel, The Indigo Girls, and Janis Ian, just to name a few. She performs over 200 dates a year throughout the USA and abroad. SONiA continues her quest to DISAPPEAR FEAR through her music. Robert Westweild of The Abingdon Virginian wrote, "The brilliant SONiA rocked Johnson City's Down Home in an unforgettable, heart-tugging homecoming benefit last Saturday night, sweeping the winds of change throughout the land in a manner unheard of since Bob Dylan, making audience members weep, even as they leapt to their feet to give her ovations." 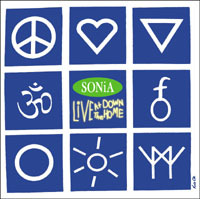 From the stages of major folk festivals, at coffeehouses, at rock clubs and Marches for Human Rights, SONiA's voice and messages of love, hope and understanding come through loud and clear. You can also visit sonia's website at www.DisappearFear.com.